@ chris can you make a version with a darker background ? it will be interesting to compare the two version. Good call rabble1narms. I was staring at the nose thinking why does it look so flat. Failing to see the wood for the trees! I put a small spot light just on his nose so as not to disrupt everything else. I have also gone in for some heavy post fx including a fair bit of sharpening to give it some bite. This has pushed it away from the reference image but that Bladerunner frame seems to be smoothed out due to compression. I think the sharpness is arresting and I’d like to know how to do that in Arnold if possible. The sharpening is a bit of a cheat to make him look wet and greasy without using the shaders to do it completely. I have noticed that my image and other people’s look quite different full size, so it’s a good idea to go full screen on them. jojo1975, thanks for your input too. I should know a thing or two about how rain looks since I live in London, however I have added a few more drops. The blood remains dry for now I’m afraid! It’s another challenge to get it wet too. It was hard to get it to stand out as red among the blue lights I used. I should have lit with white and graded it all together perhaps. I think I’ve learned a lot about the Arnold skin shader. I would approach it differently next time. Many thanks to the thread moderator and Steven Stahlberg for the model. Unfortunately i lost my old composition so i did it again.More darker than before. Looks great! Very artistic and balanced feel. Emotional too. Tiny things that stood out to me. 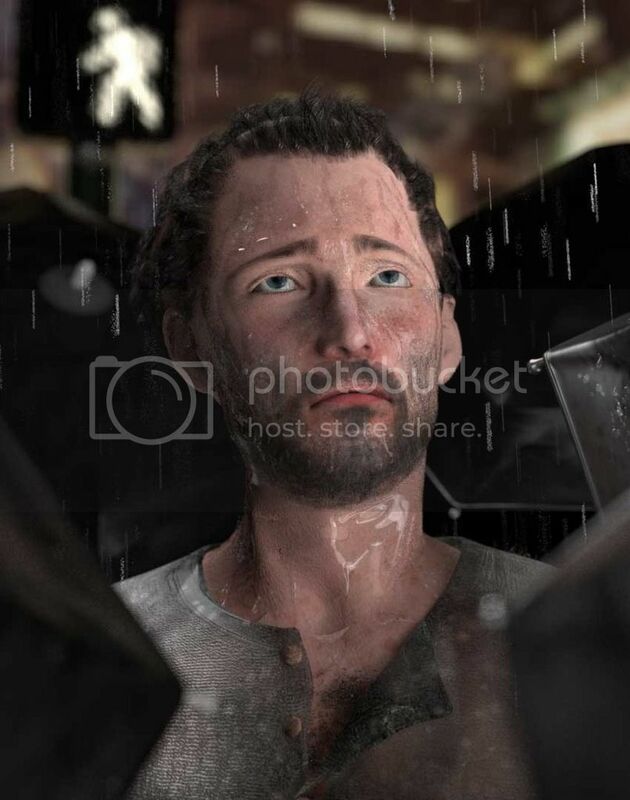 The rain over his face is pure white. Surely not may things are that pure, except perhaps the eye highlights? Try a tiny bit of green or blue in there. The specular reflections in the eyes don’t match which puts me off a little. If they are both reflecting the same thing and are both almost spherical shouldn’t they match a bit more? Plus, is the darkness under his chin and on his neck correct. If there was that much light falling on his face wouldn’t some bounce back off the floor or surrounding environment and make it not complete black in that area? This could be the film grade making it black but his face isn’t that heavily graded. Of course you can discount this question by just saying that’s artistically what works best! The white blob in the background is a bit distracting compositionally. It draws the eye away from the focus point you intended. The rain over his face is pure white. Surely not may things are that pure, except perhaps the eye highlights? Try a tiny bit of green or blue in there. I was using B/W background so i changed some colors on post.You were right! The specular reflections in the eyes don’t match which puts me off a little. If they are both reflecting the same thing and are both almost spherical shouldn’t they match a bit more?Something weird happened with reflections. Plus, is the darkness under his chin and on his neck correct. If there was that much light falling on his face wouldn’t some bounce back off the floor or surrounding environment and make it not complete black in that area? This could be the film grade making it black but his face isn’t that heavily graded. Of course you can discount this question by just saying that’s artistically what works best! It was intentionally dark but i added some GI to fill the dark. The white blob in the background is a bit distracting compositionally. It draws the eye away from the focus point you intended. [b]Corrected.I didnt liked too. [/b]Also added some blood veins to his eyes. PS: CGX YOUR IMAGE IS SUPER! Thanks chris_lwgr - I could not resist having a go at grading your image. Hope you don’t mind! Added blood using the prestonplatt technique mentioned above. Added some images of Tokyo in the background. You might not believe me but they are there. A bonus image!. A Blade Runner 2 teaser poster inspired by the fact filming begins in 2016 and early information indicates that it will again star Harrison Ford with Sir Ridley Scott producing. If you share this please credit Stahlberg for the model. I need to add that my character has obviously had his eyelashes cinged off during whatever he has been through!. I only just noticed the model came with eye lash placement polys.I have also pushed it away from trying to achieve ‘realism’ towards some kind of illustration style. Does this work? Drag them to your address bar to view full size. Sorry if people are seeing these more than once. I have made a new guy using what I learnt on the old one. The previous one had no real SSS in evidence so I have tried 3 different SSS image maps on this one. First test, very difficult one. You’re right - thanks. I think I didn’t vary the brush size whilst sketching them on in PaintEffects. Nice, well done! My instant reaction is that it is a lifelike image. The DOF and film grade are good, the composition and positioning of the head and body are good. It’s only after a few seconds you begin to question a few things. Is the eye iris too big? Is there a need for bump texture in the skin to give us a feeling it’s real skin. At the moment he looks a tiny bit like and ‘action man’ scale figure. I’m guessing this may be to do with the way the DOF encloses him. Might also be that scatter settings in the SSS shader. Worth checking scale in your scene for physical accuracy if that’s what you want. Latest iteration. Need to up the samples in Arnold to get a less noisy render. Some of the grain is my comping but a lot came in the render.